Barbara Pierce Bush is the wife of the 41st President of the United States George H. W. Bush, and served as First Lady of the United States from 1989 to 1993. She is the mother of the 43rd President George W. Bush and of the 43rd Governor of Florida Jeb Bush. 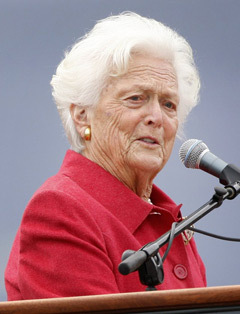 Previously she had served as Second Lady of the United States from 1981 to 1989. Barbara Pierce was born in Flushing, New York attended Rye Country Day School from 1931 to 1937, and is an alumna of Ashley Hall School in Charleston, South Carolina. She met George Herbert Walker Bush at age 16, and the two married in 1945, while he was on leave during his deployment as a Naval officer in World War II. They would have six children together. The Bush family soon moved to Midland, Texas; as George Bush entered political life, Barbara raised their children.